After holidaying on the Greek island of Santorini, I was able to renew my love of not just the sea but the beautiful Gree k interior design. Inspired by nature the Greek style truly embraces its mesmerising surroundings. 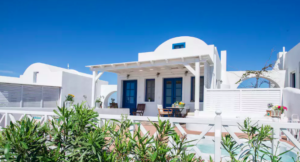 If your looking to create a traditional Greek-inspired style of home décor it’s important to use a natural colour palette and materials whilst drawing on the key characteristics of the style. These include symmetrical balance through shape, pattern, texture and colour to create proportion in your living space. The Greek style is all about less is more so that openness is created but that sense of cosiness is added through textures and finishes. 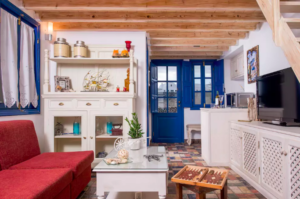 whitewashed walls throughout with different accents of blue painted on furniture, windows and decorative columns. If you would like to add a bit more to the scheme it’s suitable to draw from more of the colours outdoors. Green, purplish and red tones work best as they’re inspired by the vegetation and wild flowers native to Greece. There’s some beautifully hand crafted furniture items you can select for your living space. In a Greek Interior wood is the most common material for furnishings especially for items such as tripod tables and stools. Textured fabrics to woven or patterned provide a great touch to the wooden surface. For sofas and chairs try for simple yet refined designs with subtle curves. If you want that rustic look mosaic tiles look great for table tops. As with colour, fabrics in traditional Greek design are inspired from nature. Animal fur, wool, linen, silk and leather are all popular fabrics that will work well. Use these fabrics as inspiration for your style. Try a animal printed bed cover or large leather reading chair. If your finding your walls are looking a bit bare try draped fabrics and tapestry as wall hangings. This will adds a bit more colour and texture to the white washed walls and soften the look of the room. Greek design relies heavily on natural stone flooring including limestone or marble, which are both popular in modern Greek decor. For a more classic look try for ceramic tile or stained concrete. A soft rug is also a nice touch to break the hardness of the floor. A balcony or a patio is part of every Greek style home. Especially if you live in a warm climate, you can easily achieve this peaceful and sun-loving look inspired by the beautiful Mediterranean décor using terracotta pots and accessories. Pick some common Mediterranean plants for your pots such as lavender, thyme, rosemary, oleander and geraniums and opt for strong and rustic furniture made from cast iron or wood. To make your outdoor space look more authentic try for white and cracked walls. A good tip to get the cracked effect is to sandpaper your walls. You can also mix fine cement and fine sand onto your walls to create a dry impression. 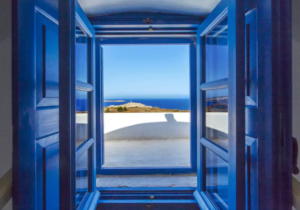 No matter what way you choose to decorate your home drawing from key characteristics of the Greek style your guaranteed to add a sense of refinement and elegance to modern and classic homes. 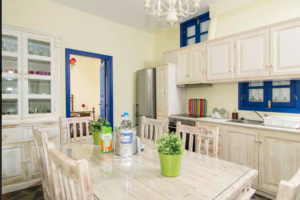 How do I find a decorator in Athrns to help with a large apartment in Galazidi?